I was bought a lovely Mothers Day card, Mellow Yellow by Alaya Gadeh. Go see. Not only is it a beautiful image, but the paper is made from responsible sources, a tree is planted for every 2500 cards sold, the ink is vegetable based and the card is fully recyclable- yes, like I would EVER throw away any of my Mothers Day cards. Springtime does makes many people think green. Gardens and Easter, seedlings breaking through soil. After being enclosed within 4 walls for months through the winter the prospect of picnics outdoors and time spent enjoying parks and gardens can be a lovely welcome. For the last 3 years I have been trying to plant things that not only look beautiful but are edible too. 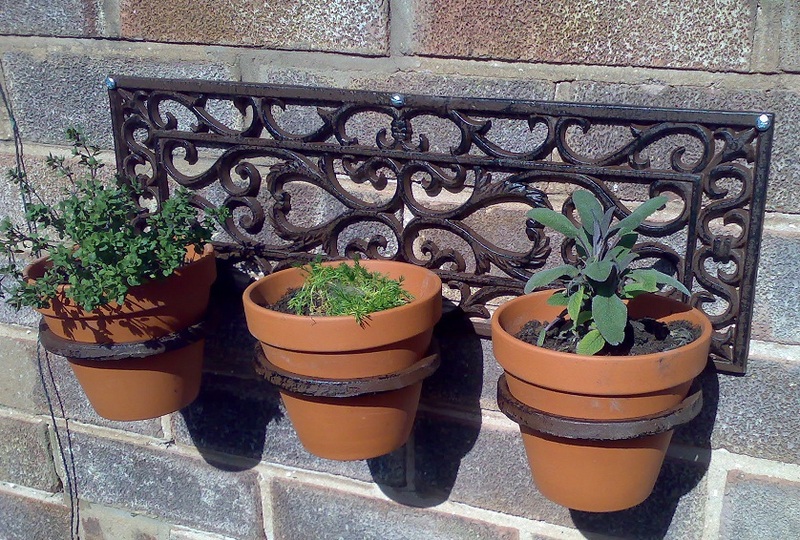 Herbs on window sills or sheltered spots are easy to grow. 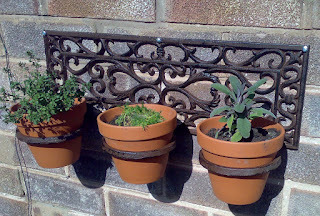 Hardy plants like thyme, oregano and rosemary will survive frosts too. I currently have tomatoes, onions, cauliflower, spinach, lettuce and more growing from seed. Will keep you posted! 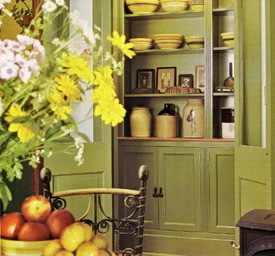 This kitchen cupboard looks fabulous painted green. Earthenware jars, yellow tones, spring hedgerow flowers...lovely country style in an old garden flat or manor house. Don't be afraid to paint over wood, if you don't like it you can paint over it again. I mentioned New Life Paints in my last post.In the interim I have been able to test drive this recycled paint. My verdict? Very good indeed! Low odour, good coverage, clean and chalky finish ( this was their Brilliant White emulsion). I had some spare Crown Ultimate white so did a test. Where the Crown appeared to be thicker when applied, once dried the results were the same. But the selling point is the fact that this company have invested time and energy to find a way to save paint from ending up as landfill by processing it to make it like new. No one needed to do this. An estimated 50 million litres of paint end up as landfill each year. 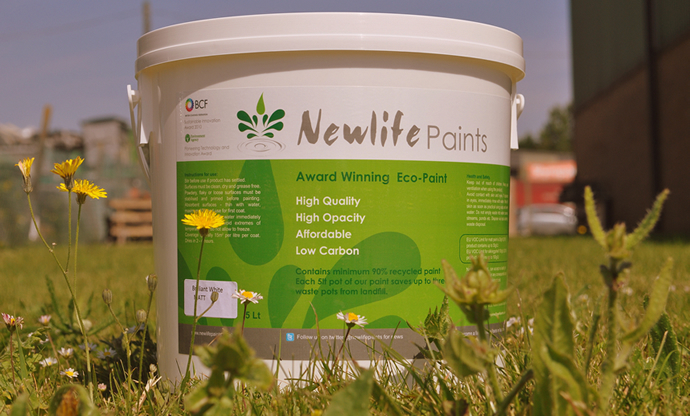 In this company's first year they reprocessed about 100 tonnes of waste paint. 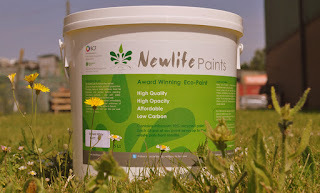 Thoroughly recommend you visit New Life Paints website and ask your local council how they recycle paint.